As a family we are keen to raise awareness of Kleine Levin Syndrome (KLS) and to support the UK support group, in the hope that one day they will be able to help find a reason why KLS happens, and a way to make it stop. This legendary mountain adventure race starts at sea level in the stunning Caernarfon Castle and weaves its way to the summit of Snowdon and down the other side into Dinorwic Quarry where we’ve thrown in an array of punishing obstacles, including the infamous Vertical Kilometre, for you to tackle before you can cross the finish line victorious. Jake will run and walk over 22 miles, ascent to 5055ft from sea level, all in one amazing day supported by his University friends. This is no mean feet for someone with a sleeping condtion. More details of the event here. KLS Support UK is a UK based support group for Kleine Levin Syndrome set up by three parents in 2012 .Their goal at the moment is to education professionals about KLS so that more cases are recognized quickly, as many patient go between 3 -5 years without a diagnoses, they also aim to support families. We are lucky - Jake had a diagnosis in the first six months, and since diagnosing us our consultant has got more involved in KLS Support UK and ensured that the first KLS conference in the UK happened, she is now one of their UK Medical Advisers. We started fundraising for KLS Support UK in December 2012 with an online shopping site, which donates money for KLS for every online purchase you make - at no cost to yourself... and if you register your credit card with them - in participating stores too! In 2014 Jacob set himself a goal that with the help of family and friends he would like to raise at least £2,000 for KLS Support UK, below are a list of the activities we have done ... in the hope we may inspire other families to raise funds too. At the present time - there is no answer to KLS, but we hope we can raise awareness as a family, share our story and support the UK charity. We had a kind donation from Michael Parker of Salisbury who asked for the collection from his memorial service to be donated to Kleine Levin Syndrome which we have forwarded onto KLS support in his memory. The £181.35 has been passed onto KLS Support UK. The Great South Run is a 10 mile route takes in the iconic sites of the Portsmouth Historic Dockyard including Portsmouth Cathedral, Spinnaker Tower and the HMS Victory- and is a huge running event which every year attracts a plethora of athletes, celebrities and runners raising money for good causes, with over £30 million having been raised for charity over the years. In 2015, Matt and myself... have pledged to join the run raising awareness for Kleine Levin Syndrome, with money raised going towards KLS Support UK and we would appreciate as much support as you can offer. 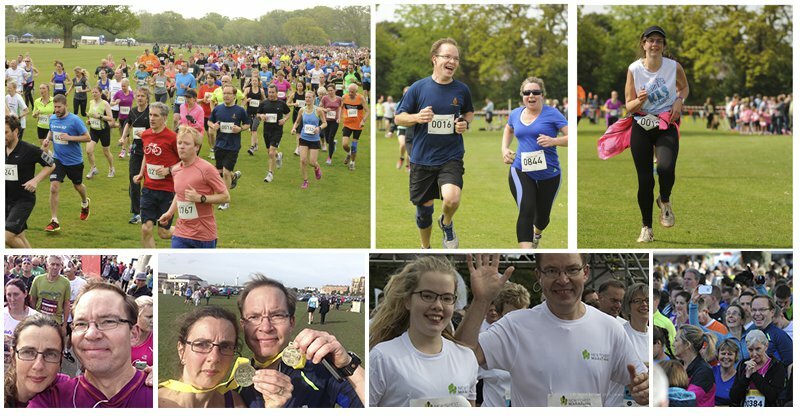 More details and to sponsor us visit: https://mydonate.bt.com/fundraisers/klsrun - can you help? Our challenge is for everyone – the stereo typical image of Sleeping Beauty – someone who sleeps and sleeps missing out on a huge amount of time. Unlike Sleeping beauty – the world does not wait for KLS patients to wake. The world moves on – the patient misses birthdays, Christmas, school, work, driving tests, it is endless and those moments cant be replaced. KLS is more than sleeping and is incredibly difficult to understand. and you can still donate here - as of May 2014 - through the online link, gift aid donations and cash donations we have raised an amazing £653.25p. Thank you to everyone for your support, we look forward to handing it over to KLS Support UK in September at their next conference. In March 2014 - we celebrated our joint 40th birthday (Jake's parents) with a party and great food by the amazing White Horse Pub in Milford on Sea. We asked all the guests to support the raffle we had running on the evening - and to try and win one of the raffle prices that we had collected. We are delighted to announce that we raised £365.38p and we will be presenting this to KLS Support UK at the Autumn Meeting. Jacob's grandma wants to help raise funds for KLS too - she has been handmaking a range of fantastic greetings cards - she is selling the cards at £1.25 each and 25p from every card sold will be going towards the total we are trying to raise for KLS Support UK. She has arranged to exhibit them in the local libary for a month and is happy to take orders for a selection of themed pack of cards. If you are interested in purchasing some then please contact her direct - mary@ourbench.co.uk. So far Grandma has raised £75 for us to hand on to KLS Support UK. 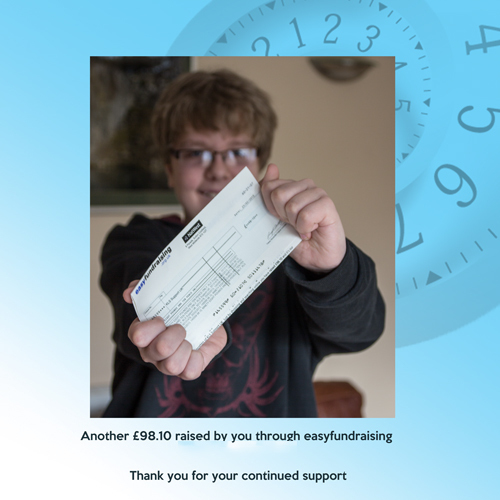 Jake decided that he wanted to support KLS Support UK, and to have something to show for the period of time that he has spent in episode and so decided to set up an Easy Fundraising account which raises funds for KLS just through using a search engine and shopping on line, and if would be delighted if you got involved too - there is no extra cost to yourself... you can help the charity every-time you shop. The above photo was taken in Feb 2012 - Jake is in episode, his more childish facial features give you that clue. We started the easy fundraising account for them in the Autumn 2012 and were delighted to send it our first cheque in December, and over the years have raised over £1000 this way. 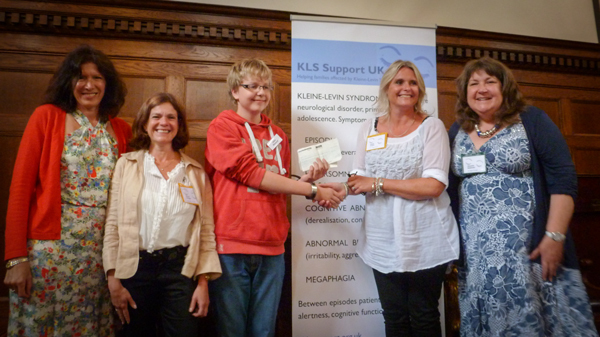 Below is a photo of Jacob presenting his cheques to the KLS Support UK committee in London at their 2nd conference in September 2013. The above photo is with the KLS Support UK Committee - September 2013 in London - taken out of episode. 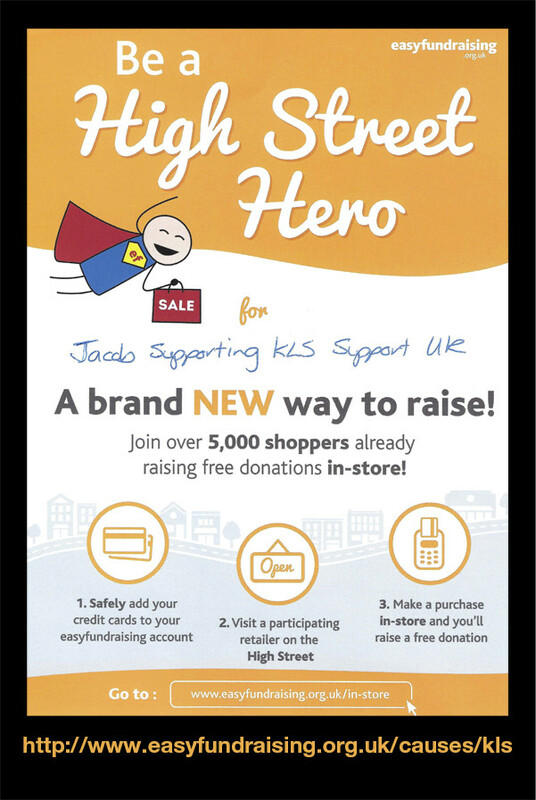 You can also raise money every time you search the Internet - save http://kls.easysearch.org.uk/ as your search engine and every search helps contribute to Jacob's fundraising appeal. and it is amazing to realised he has now raised nearly double that. KLS Support UK arranged for families with KLS to meet in Manchester in 2012 - we went along and it was great to meet other families with KLS - our report of that event is here. KLS Support UK planned a second meeting in London in September 2013 and we went along again - our report of that event can be found here. 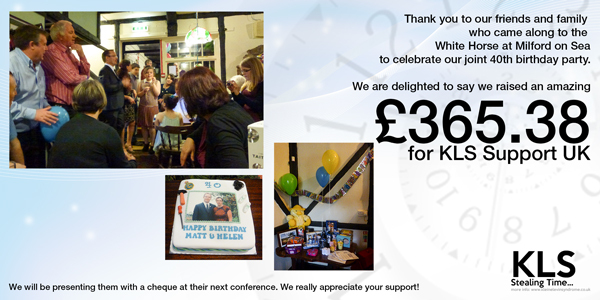 KLS Support UK helded a third meeting in September 2014 where we handed over an amazing fundraising cheque of £1,226.29 - which we had raised in the last twelve months. KLS Support UK held their fourth meeting in September 2015, which was much more informal and enabled families to meet, share their experience, the latest KLS details and to realise they are not alone. KLS Support UK are planning a meeting in the Autumn of 2016, see their web site for details. If you would like more details future KLS Support UK events then please contact KLS Support UK via their web site, and we hope to meet you there. We are not involved in running KLS Support UK, we are just a family who appreciate their support. We will continue to support the National Support Group, tell new families about them (suggest you register with them) and raise funds for them, hoping that one day that will be an answer to KLS.